During a company expansion, some systems will scale, and others will not. The growing period is an exciting time for many businesses. It’s a sign of strong business, and the addition of new clients, co-workers, facilities, and technology opens the way for a company to better position themselves to take advantage future opportunities. However, growth also adds burdens to an organization. With the additional responsibilities of an expanding business, departments can grow strained. HR has more people to care for, newly-hired or newly-promoted managers are still settling in to their job, and IT staff are often stretched thin as they struggle to keep up with the influx of new IT needs. During an expansion period, scaling IT with a sustainable and forward-thinking strategy can alleviate stress in other departments and save businesses money in the long run. But setting aside the time to thoughtfully plan for the future of your IT systems when so many other factors are urgently calling for your attention can be a challenge. Nevertheless, taking a moment to ask yourself a few questions can help you set some priorities for scaling your growing IT needs. 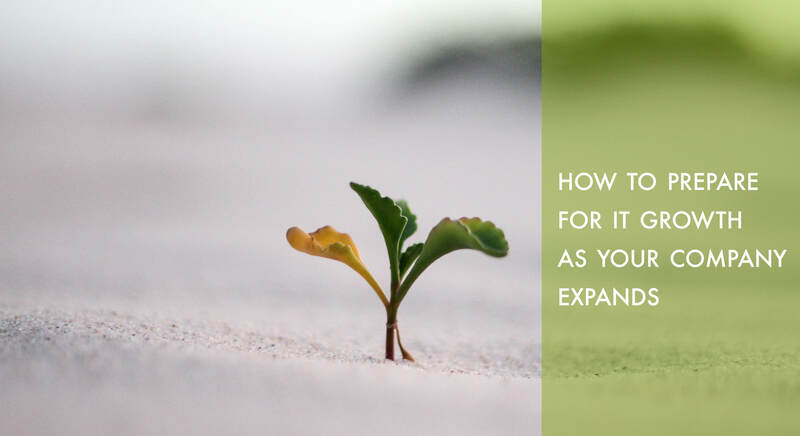 Here are some questions to get you started as you begin planning for your expanding IT needs. What software programs and applications do you actually use? To start, take an audit of your current office equipment any software license fees you’re paying. Sometimes, in the churn of new hires, equipment and applications can go overlooked. Before you buy new equipment or sign up for new services, it’s wise to make sure you’re not duplicating anything. This can be particularly true in a small company, where software purchasing decisions often happen impulsively, and with no centralized oversight. You or one of your employees might have jumped on a subscription service thinking it would get a lot of use, and now you’ve forgotten about it and no one uses it even though you’re still paying regular fees. Who has access to your various technology programs and devices? Similarly, as employees shuffle positions, with some leaving and others taking on expanded positions, it’s a good idea to take stock of who has access to what. You might have bought licenses to Adobe CC for your graphic design team originally, but now the computers they used to use are in the accounting department and you’re paying more than you need. Meanwhile, your accounting team needs access to the project management software to track billable hours, but they can’t figure out who’s responsible for granting them permission. Access permissions are especially important for businesses that handle sensitive information that could fall under compliance regulations. Certain folders or passwords might require controlled access, and details about access permission and file ownership information can quickly fall through the cracks. Taking time early on to review access can save you trouble down the road. One of the easiest ways organizations cope with expanding IT needs is to defer the question entirely with a BYOD policy. By allowing employees to bring their own laptops, mobile phones, and tablets into work, they can avoid buying that equipment themselves. In the beginning, small organizations often rely on informal policies. But as roles expand, an official BYOD policy helps answer crucial questions such as what applications programs the employer will ask a user to install, and whether the employer will provide any monetary compensation for repairs, replacements, or upgrades. Do any of your applications overlap, and could they be consolidated? In smaller organizations, programs and applications are often chosen by whoever’s job it is to use them. The project manager chooses a project management application they like, and not a lot of discussion goes into the decision because there aren’t any other project managers. In a growing company, more people means more preferences. Project manager A who chose software A is now joined by Project Manager B who is more used to software B. If they’re managing separate teams and there isn’t much difference in expense from a business perspective, that may not be a problem. But when employees have to work together on the same platform, or when paying for separate programs leads to additional expenses, then it’s time to re-think the strategy. That said, sometimes programs that appear to be similar perform slightly different functions. Any specialist will have a series of tools which they use for the job, and if a specialized tool (or computer program) saves enough time or performs a task better, it may be worth keeping around. What programs will help you scale in the future? Some programs are designed for small businesses. Others are built for enterprise corporations. The point at which they cross over is not always clear, but making the transition from small platform to enterprise system is an important step in your company growth. If you’re choosing between two programs, think beyond price. Enterprise programs are more expensive, and there’s no use overpaying for them if they’re more than what you need. But before investing in a smaller system you plan to use for the next five years, ask yourself if it will last that long. If you expect to be at enterprise level more quickly, then moving to that system early will help keep your data in one place and can save you the cost of retraining employees on the new system. Can your network accommodate the increased load? Scaling your office software and computer systems are one thing. But what about your IT infrastructure? Increasing the number of computers in an office space will affect more than your electric bill. It will also add pressure to your computer network. If your company is expanding into new offices, the earlier you can start planning for your IT needs the better. Ideally, you should be consulting with IT experts along with your architect, making sure the building has the right wiring for your growing technological needs and designing the space to accommodate modems, routers, and other technological necessities. Also consider the demands you’ll be placing on your Internet. Fiber optic Internet is a much more affordable investment than it used to be, and can bring your business the bandwidth you need for your workload. Will your building have a WiFi connection for employees, and a second connection for guests? Test your office space for reception, and position your routers to ensure the best coverage. Whose responsibility is it to manage your IT systems? After thinking through the above questions, you may have some better insight as to why your IT staff are so stressed. Or, if you don’t have an IT department, you may be wondering how you can go about managing these concerns. Clearly, it’s important to have someone responsible for keeping track of your hardware and software, managing license renewals, keeping your systems up to date, and monitoring network efficiency so that you can make proactive upgrades and prevent an IT failure in the middle of critical business operations. If you don’t have a designated person on your staff who can manage this—or if that person is overworked and in need of assistance—then you could consider hiring an IT partner to manage it for you. Managed IT suppliers, like Brightline, can provide the IT services you need if you don’t have any IT specialists on staff, and they can supplement your current IT department if they are overburdened. If your company needs help growing their IT along with their newly expanding business, Brightline offers a free network assessment. Contact us, and we would be happy to discuss your needs. « What Are HTTP Cookies, and Do I Need to Allow Them?